Sinn Féin has proposed €2 billion worth of tax increases, from increasing the special VAT rate for hotels to a 7 per cent levy on incomes above €100,000, in its alternative budget. 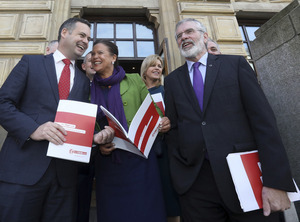 Top, from left: Sinn Fein Finance spokesperson Pearse Doherty with Deputy Leader Mary Lou McDonald and Party President Gerry Adams . Posted in Misc and tagged Budget 2018, Sinn Fein at 12:40 pm on October 3, 2017 by Broadsheet. If an individual earning more than 100K wants to get the same take home salary as before, and expects the company to stump up larger wages to compensate, then it will cost the company 23% more (of the amount over 100K). That’s steep! It worked great for the French – oh wait, no it didn’t. But the company doesn’t have to pay that. Simple as that. This is their precise proposal. This indeed adds up (I checked their numbers) if you assume it applies to all tax units above €100k. The distributional impacts are interesting. One in six double-earner couples earn in excess of €100k between them. Very few single people (about 1%) earn over €100k while about 6% of one-income married couples do. I appreciate a skilled number cruncher (I never seem to be able to find the appropriate data!). Which suggests that there are a lot of people, earning over 100K, that don’t pay employers PRSI. You can crunch the numbers at the above link for proprietary directors and the like who (I presume) do not pay employers’ PRSI. Don’t have time now myself! If the MNC’s just paid their 12.5% there would be no shortage. All the guff about giving them special treatment cos they’re fancy tech is just disgusting. 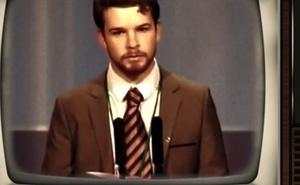 If Sinn Fein had cojones, thats who they would target. I do like their increase in betting taxes, I will say that. Yes but they propose retaining the Horse and Greyhound Racing Fund. I’d get rid of that before taxing bets. They’re all funnelled through Jersey anyway. €400 second home additional tax, another way to get more single house landlords to exit the market…..
How do they manage to get the house of the country? whooohhhh 400 euros? “guess Ill have to sell my second gaff for €100000 less than what I paid for it because 400 a year is really going to wipe me out” . said no landlord, ever. These murderers don’t think 400 means anything to these gorse hill type pigs who don’t care about paying back their depts in the first place. 400? They will either add it to the bankruptcy bill or work it into the tenants rent. Sinn Fein IRA think this budget will impress the uneducated, doley crowd who cant understand money so they can scrape a few more votes. They do not know how to run a country and don’t care. They want one thing , actually six things only and it is the counties in the backward bigot ridden north. Its their promise they make openly to the Catholics up there. They try the secular social justice approach down here, But at the end of the day they are just a power hungry group of thugs who would have us banned from speaking English and have the Vatican come back in to take care of the day to day. I think you’ll find SF have very little attachment to the Vatican. What sort of ludicrous ravings are these from postmanpat? Good night. What happens the house when the poor landlord exits the market Ronán? Does it disappear? On your side…. as long as we don’t like what you are saying or doing. Then we may have to leave you in an unmarked grave in a bog somewhere. Then you’re on the other side. they look like a trustworthy bunch. Honest, transparent and have high morals! 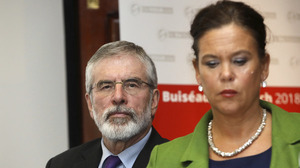 Sinn Féin claims to be about “taxing the wealthy elites”. Yet it favours a €445m cut in the property tax, even though property is where a majority of the wealth in Ireland is concentrated. The ‘Additional 5.75% Employers PRSI on salary over €100,000’ is a tax on high paid jobs at a time when the State is trying to attract such jobs here from the UK. Ditto the 7 percentage point increase on the highest tax rate. That is ideology trumping pragmatism. Now, I know that this comment will have people queuing up to say: “Good for them, if they’re on €100k+ a year they can afford it”. Sure, but how does hammering high earners with higher taxes impact Sinn Féin’s big plan to recruit more medical professionals? Australia and other climes will only seem more attractive for medical school graduates. 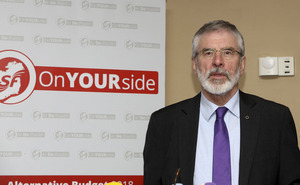 Given the choice between €2bn of tax hikes under Sinn Féin and modest tax cuts under FF/FG/Labour, I think most people will say no to Gerry Adams. The original ‘Orange One’ is back in hue ! So why drop the property tax, the only quasi “wealth” tax in the country and one based on an immovable asset? Its financially illiterate to drop it if the goal is to make “wealthy” people pay a bigger share – anyone with a big but not enormous pension pot (ie they draw an income of less than 100k per annum from it, but could have personal wealth of €3-4m between pension and family home) could be given a 3-4k a year tax break from this! Their uncosted proposal for a wealth tax “with some exemptions” will almost certainly leave out the family home and pension pots, so the big winners from this budget will be well off retirees! Bonkers. Quelle surprise, Sinn Fein propose to lump more tax on people who don’t vote for them and use the cash to benefit people who do vote for them. The whole budget extravaganza is boring. Paschal doesn’t even have a little red briefcase like that moron Hammond will have. It would be more interesting if they did it in fancy dress or had a jersey day. Abolishing the property tax demonstrates they are (a) not serious about governing and (b) are populist rather idealistic. If they were in any way competent, younger people especially, would be queuing up to vote for them as no other party gives a toss. I wouldn’t be so sure about some of the other things in that, but increasing the tax on those earning over 100k raises a massive amount of revenue. Its impressive. I wouldn’t be surprised to see the more centre-ist parties steal that if they’re smart – its hard to argue anyone earning 100k+ is part of the much loved “squeezed middle”. Ideally the extra money would be used for infrastructure, but if it was used to raise the higher income tax threshold to 35k say, or raised the threshold for the USC, it would at least help large numbers of people. And win large numbers of votes for whoever introduces it.